International cotton prices in the second half of November moved to the bottom of the lower price range that has been in evidence since New York registered consecutive sharp declines in late September and early October. The Cotlook A Index reached a high point early in the period, at 88.6 US cents per lb. However, various macro-economic factors continued to impact market sentiment and the weakness of asking rates saw the Index fall to its lowest level since early October on November 28, at 85.85 US cents per lb. The Index ended the month only slightly above its opening level, at 86.55 US cents per lb. The downward trajectory of prices was attributed mainly to the continuing Sino-US trade war, which was combined with wider financial and currency-related woes experienced by many ‘emerging’ markets, most notably Turkey. The recent decline in raw cotton asking rates also placed pressure on cotton yarn prices, at a time when spinners were processing stocks purchased at considerably higher levels than those in force of late. Hence, mills complained of narrowing profit margins and were reluctant to add to their sometimes already substantial inventories with any volume purchases. Most mill buyers were focused on gap-filling purchases of cotton available afloat or nearby. Forward purchases were also sparse, as mill buyers awaited some clarity as to the direction of prices, as well as the future trade relationship between the world’s two largest economies, the US and China. The meeting of the Chinese and US presidents on the occasion of the G20 Summit, held in Argentina on November 30 and December 1, was therefore keenly anticipated. In the event, the market reaction was fairly muted; an initial upturn was registered in New York, prompted by positive indications from the two presidents that no further escalation of the tariff dispute will be implemented in the next 90 days. That period has been allocated for fresh negotiations. In the meantime, clarity is awaited as to precisely which of the measures on which agreement is claimed to have been made at the meeting will be implemented. To date, no tariffs have been lifted or eased, nor has evidence emerged as yet of any additional Chinese purchasing of US agricultural products. The initial fillip to cotton prices has thus not been maintained. Perhaps unsurprisingly, the progress of the US marketing campaign has faltered somewhat; in the weekly reports released during November, upland cancellations and destination changes for China continued to rise, to total over 500,000 running bales (although new sales resulted in a net reduction to the sales commitment of about half that volume). A considerable portion of Chinese cancellations appear also to have been switched into contracts for shipment in the 2019/20 marketing year; at the time of writing, China accounts for almost half of the US upland export sales commitment for shipment next season. The heaviness of that commitment has led some observers to suggest that Chinese importers could be anticipating a resolution of trade tensions by such a time as the crop is ready to be shipped. However, a less sanguine perspective suggests that the moves could indicate that Chinese buyers would prefer not to unload their US purchases that have so far been accumulated, considering the lack of clarity regarding future trade relations. Chinese import demand overall has been sluggish in recent months. The additional import quota announced by the government has now been available to mill buyers for some months, but few showed much appetite for business during November. As well as the prevailing influence of the trade war, the price of foreign cottons vis-à-vis domestic lint had offered little incentive to enter the international market. The exception was Brazilian cotton, which encountered fairly regular demand, but the window for shipment is closing; it may be recalled that cotton purchased against this year’s quotas must clear China customs by the end of February. USDA’s November estimates of production and consumption included a lower export forecast for the current season, of 15 million 480 lb bales. The marketing campaign made a strong start early in the season, and was bolstered further by an upturn in export registrations during the week ended November 22, probably as a result of business conducted in the fringes of the US Sourcing Summit earlier in the month. However, any further intensification of Chinese cancellations, or a return to the more pedestrian pace of sales that was in evidence before the Sourcing Summit, could cast doubt on the likelihood of USDA’s export projection being achieved. 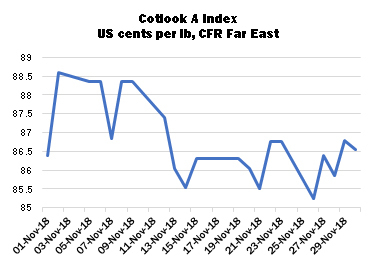 Cotlook’s estimate of US production was reduced following release of USDA’s most recent crop assessment, which took account of the damage inflicted about a month earlier by Hurricane Michael. Output is placed at just over four million tonnes, representing a decline of around 12 percent from last year. Elsewhere in the Northern Hemisphere, downward adjustments were made for India and Pakistan, where the adverse impact of pests and water shortages during the growing season became clearer. Unhelpful weather during the growing season also saw estimates lowered for some of the major Central Asian producers. The only notable increase was for Brazil, where observers continue to predict a sharp expansion of planted area. Our forecast has been increased to 2.3 million tonnes, which would represent a new record, but is still considered conservative in some circles. On the consumption front, the above-mentioned macro-economic issues have weighed on market sentiment and a downward bias is evident in many forecasts. Our figures underwent only one major adjustment in November, a reduction of 200,000 tonnes for Turkey, owing to the impact of financial difficulties faced by the country during recent months. However, close attention will continue to be paid to China, where burgeoning stocks throughout the textile pipeline are construed as being indicative of a slowing market. Taking account of these changes, Cotlook’s estimate of world production in 2018/19 stands at 26.02 million tonnes, against 26.523 in the previous season, while our figure for consumption is 26.84 million tonnes (versus 26.268 in 2017/18). 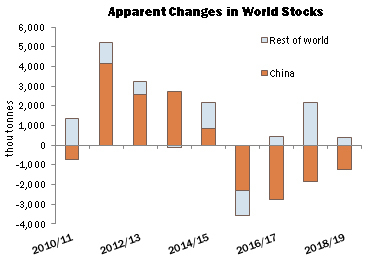 Our assessment of the world balance sheet therefore implies a reduction in global stock levels of 820,000 tonnes at the end of 2018/19, which the change occurring almost entirely in China.